This visit was a laden one. 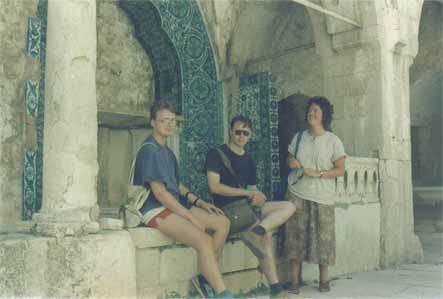 We left The Netherlands three days after the invasion of Kuwait by Saddam Hussein, and it was clear that the Palestinian as well as the Israeli Arab population was edgy and not too keen on tourists. In fact there was a shopskeepers' strike, which left only a few businesses in the old town open when we arrived. Stones were thrown on more than one occasion, mostly by young children. Jerusalem did however not share the tense atmosphere we encountered elsewhere in Israel, and most of the visit was very pleasant. The old City viewed from the south. The modern City, as seen from the Israel Museum. In the valley live squatters. A reminder from a recent troubled past: shot-up street sign. Old walls - new gods. The ancient city of Jerusalem has a history that goes back to several thousand years before the arrival of the Romans, and I won't dwell on that part here. Suffice to say that Jerusalem, or rather Jebus or Sion, was already a Bronze Age settlement, and its situation on a major route to the East continued to ensure its importance, which has lasted from earlier than a 1000 BC up to the present day. Not only the Canaanites, the Israelites, the Egyptians, Assyrians, Babylonians and Persians needed to dominate this city, it also fell to the Macedonian Empire of Alexander the Great and his successors. But let's look at Jerusalem in the days of the Romans. 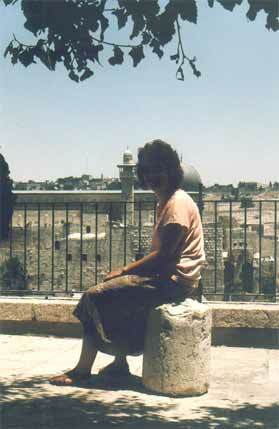 First, however, a grim tale, because I'd like to take you along to the bad days that ended the 'old' Jerusalem. The Jewish Wars apparently started over religious differences, but the conflict went much further back in time. The Jews, whose Hasmonean dynasty of the Maccabeans had controlled the city for a brief period after succesfully sesisting the Macedonians, had been overthrown by the arrival of the Romans. After the death of Queen Shlomzion, widow of King Yannai, a bitter battle was waged between their two sons, Horkanos and his younger brother, Aristobulos. This enabled the Roman general Pompey, to gain control of the Hashmonean kingdom, to tear away considerable areas of the state, and to transform it into part of the Roman Empire. 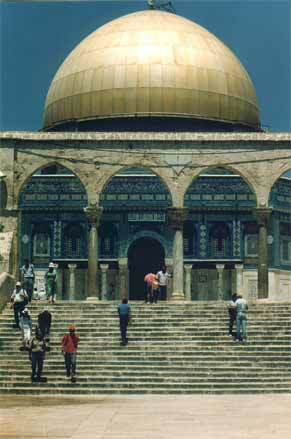 In the year 63 BC, the Temple Mount fell into his hands, and Pompey entered the Holy of Holies. Of course the Jews never forgave them that. Insult was added to injury when the Romans appointed the Herodian family from Idumaea (modern Jordan) to rule over them, in the person of Herod the Great and his descendants. Already Pontius Pilate had an alarming conflict with the Jewish populace over graven images in Jerusalem, but he relented when the Jews offered their necks up for mass execution - a sign of worse things to come. Another conflict arose when Gaius 'Caligula' attempted to force placement of his statues in the Temple via the army. Strong Jewish resistance reacted, insisting they all would have to be sacrificed! This led to Petronius relenting, as Pilate had done. The storm really broke for the first time under Antonius Felix (the Roman governor from 52-60 AD). Apparently, an indecent gesture by a soldier at the Temple in Jerusalem led to Jewish riots, and 30,000 died. The real reason for the war was the impoverishment of the Jewish peasantry. Sixty years of Roman taxation had meant only one thing: the Jews had to pay money, which was spent in Italy and on the border. Judaea had become substantially poorer and many peasants had been forced first to mortgage and then to sell their land. 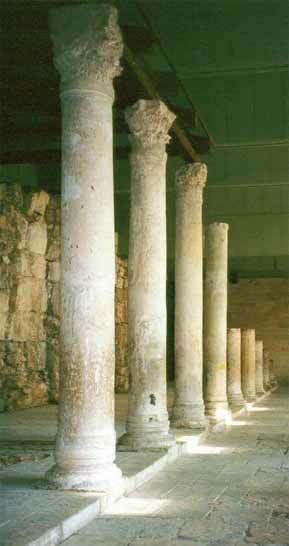 Besides, in Jerusalem many people had become unemployed when the renovation of the temple was finished in 63 AD. The peasants and artisans had a reason to fight, and they were willing to do so. Around this time, the Jewish community was wracked with inner strife and religious conflict. False messiahs abound and religious fraud was also common. There seemed to be a growing problem with bandits (Greek lestes = bandit, brigand, terrorist, guerilla, or freedom-fighter). Clashes were also reported between Jews and Samaritans after the murder of a Galilean (Jew). Atrocities were also committed by the Sicarii. The word sicarii is a Latinized term for the Arabic-Semitic word 'askar, which means 'soldiers'. Under their cloaks the Sicarii concealed sicae, or small daggers, from which they received their name. The Romans considered this an assassin's weapon. At popular assemblies, particularly during the pilgrimage to the Temple Mount, the Sicarii stabbed their enemies or, in other words, those who were friendly to the Romans, lamenting after the deed and thus escaping detection. Judas Iskariot may well have been a Sicarii. The other main Jewish group of insurgents were the Zealots, who attempted to expel the Romans and their partisans from Judea, even resorting to murder to obtain their objective. Another disciple, Simon 'the Cananaean' (a code-word for Zealot) may have belonged to that group, as may have James and John, who were nicknamed 'sons of thunder'. Even Peter could have originated in such a group, for he could have been one of the Bar Jonim ('Those outside the Law'). "The one part were desirous of tyrannizing over others, and the rest of offering violence to others, and of plundering such as were richer than themselves. They were the Sicarii who first began these transgressions, and first became barbarous towards those allied to them, and left no words of reproach unsaid, and no works of perdition untried, in order to destroy those whom their contrivances affected." ".. these men, which should be guilty of the greatest madness; for they, vile wretches as they were, cut the throats of the high priests, that so no part of a religious regard to God might be preserved; they thence proceeded to destroy utterly the last remains of a political government, and introduced the most complete scene of iniquity in all instances that were practicable;"
"Upon Festus' coming into Judea, it happened that Judea was afflicted by the robbers, while all the villages were set on fire, and plundered by them. And then it was that the sicarii, as they were called, who were robbers, grew numerous. They made use of small swords, not much different in length from the Persian acinacae, but somewhat crooked, and like the Roman sicae, [or sickles] as they were called; and from these weapons these robbers got their denomination; and with these weapons they slew a great many; for they mingled themselves among the multitude at their festivals, when they were come up in crowds from all parts to the city to worship God, as we said before, and easily slew those that they had a mind to slay. They also came frequently upon the villages belonging to their enemies, with their weapons, and plundered them, and set them on fire. So Festus sent forces, both horsemen and footmen, to fall upon those that had been seduced by a certain impostor, who promised them deliverance and freedom from the miseries they were under, if they would but follow him as far as the wilderness. Accordingly, those forces that were sent destroyed both him that had deluded them, and those that were his followers also." The victims of the Sicarii included Jonathan the High Priest, though it is possible that his murder was orchestrated by the Roman governor Antonius Felix (52-60 AD). Some of their murders were met with severe retaliation by the Romans on the entire Jewish population of the country. In other instances, they could be bribed to spare their intended victims. 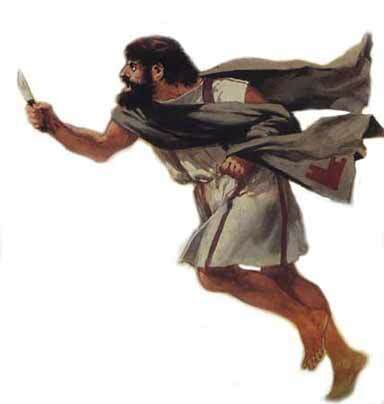 Even convicted Sicarii were occasionally released on promising to spare their opponents. Once, after kidnapping the secretary of Eleazar, governor of the Temple precincts, they agreed to release him in exchange for ten of their captured comrades. A modern name for Sicarii would be terrorists. Not having learnt any lesson from the bloody uprising of Boudicca in Britain, Gessius Florus (procurator 64-6 AD), engaged in violence and the plunder of whole cities, but on the other hand condoned the activities of the bandits. Florus, on orders from Nero to provide money, then went so far as to confiscate it from the Temple treasure. The governor was not amused when some Jewish jokers passed the hat round for 'that poor Florus'. He demanded their punishment, but when his policemen couldn't find the mockers, he had some passersby arrested and crucified. The Jewish citizens then appealed to Cestius Gallus (legate in Syria 65/6 - 67 AD) for help against Florus. Cestius promised to help, but Florus, who must have known his own position to be in serious danger, provoked an insurrection to divert attention from his own crimes. Local war inevitably broke out in May-June 66 AD. For a time the conflict was low-scale, with riots and murder being the main action, but gradually the situation got out of hand. Jews started fighting Jews, Jews murdered Romans, Romans began attacking Jewish communities. 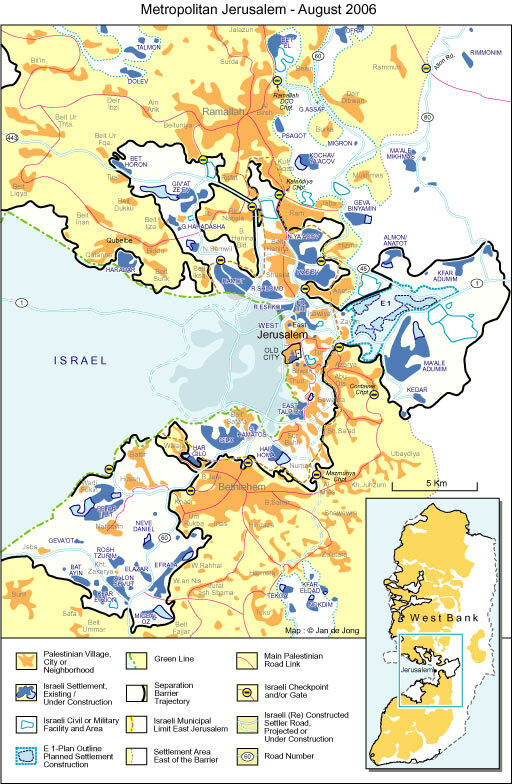 Cestius then invaded Galilee in an attempt to restore order and quell all rebel groups. He even approached Jerusalem, but after a defeat at Beth-Horon he withdrew, leaving much material to the rebels. In August 66, a man named Menahem ben Jair, a leader of the Sicarii, made a raid on the fortress of Masada, where he seized lots of weapons. This Menahem was the son or the grandson of Judas the Galilean, who had led an anti-Roman revolt in 6 BC; two of his relatives had been crucified after a similar disturbance. They hailed their leader as king of the Jews and went to Jerusalem, where they laid siege to the remaining Roman garrison. Other leaders included Eleazar ben Jair, John of Gischala and Simon bar Giora. The new king committed a series of atrocities, such as the murder of the high priest Ananias. However, when he went to the Temple, he was lynched by the adherents of Ananias' son. The Sicarii then left Jerusalem and occupied fortresses like Masada. Many citizens also fled Jerusalem, while the rebels seized large parts of Judaea and Galilee. Then, as the revolt seemed to get out of hand, the general Titus Flavius Vespasianus was sent by the Emperor Nero. Attacking with an army of three legions (V Macedonia, X Fretensis and XV Apollinaris) and numerous auxiliaries, Vespasian began a serious campaign. In 67 AD, he reconquered Galilee, capturing the Jewish commander Flavius Josephus (to whom we owe most of the story). After capturing Caesarea, he went on to isolate Jerusalem in the year 68 AD. However, the Emperor Nero died, and Vespasian became one of the major contenders in the ensuing civil war, finally securing the Imperial throne in 69 AD. Not forgetting the situation in Judaea, he placed his son Titus in charge of the war and reinforced the army with a fourth legion, XII Fulminata. Auxiliaries had been sent by two petty kingdoms on the Upper Euphrates, Commagene and Emesa; an Arabian sheikh with a deep hatred for the Jews had also joined the Romans with his warriors; and from Italy arrived many adventurers - veterans from the defeated armies of Galba and Otho. 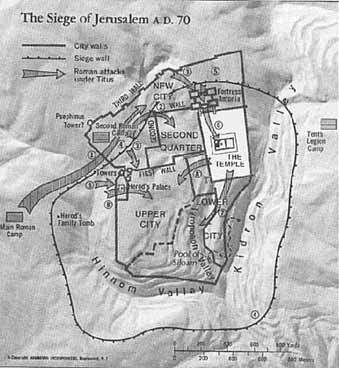 In April of 70 AD, Titus encircled Jerusalem and began a terrible siege. At that time Jerusalem was full of Passover pilgrims, which some estimate to have numbered up to a million, and resources quickly became scarce. The defenders, however, were far too much engaged in fighting each other for supremacy to mind the Romans outside the walls or the worsening situation within. Several politically rivalling groups, fanatics like Sicarii and Zealots among them, bitterly fought each other for control of the five city parts, burning parts of the city and destroying more food in the process. The Old Town, situated on a steep plateau in the south, was held by Simon bar Giora and his 10,000 Jewish warriors and 5,000 Idumeans. The Temple complex and the castle Antonia was occupied by Eleaser's 2400 Zealots. John of Gischala's militia, 6000 men, held the New Town to the west of the Temple complex. Finally, the northern quarter named Bezetha (which also means New Town), was still a new quarter, and more than half a million pilgrims who were trapped inside the city, were forced to live in tents there. This was the spot where the Romans meant to attack first. When Titus began his assault, some attempts at a defence were made, but in vain. The New Town, largest of the five walled parts, quickly fell into Roman hands, and within five days also the Middle Town fell. Only the Old Town, the Temple and the fortress Antonia now were in the hands of the defenders, who still fought amongst themselves, but also put up a stiffer defence. 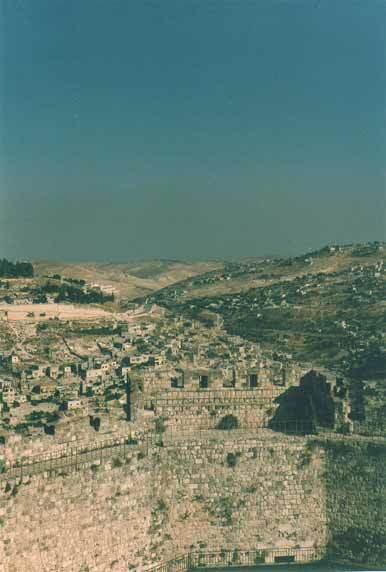 Titus reacted by building a rampart and palisade around the city, cutting it off completely. After hard fighting, Antonia fell and was torn down. The Temple held out for five more weeks, but when the defenders refused to surrender, the gates were fired. Josephus tells us Titus meant to spare the Temple, but it burned down anyway. However, later sources deny that story, and accuse Titus of intentionally destroying the Temple as a religious focus. It was burned on July 26. Last to be conquered was the old town, but the Upper Town part resisted till the end. The Romans built siege works, while inside, the civilians starved, even resorting to cannibalism. Then the Romans stormed the walls. It was September 26, 70 AD, and Jerusalem had fallen. It had taken Titus five months to conquer the town against uncoordinated, yet bitter resistance. Cruel acts, even for those times, had been committed on both sides, and the victorious Romans spared few. Exactly four years earlier, the last Romans had surrendered and had been lynched. Now it was their turn. Thousands of refugees and captives had been crucified during the siege (the hills around the town are said to have been stripped bare for the wood), escapees had been cut open because it was rumored they had swallowed their jewels. It took some years before the last resistance in Palestine was ended (apparently at Masada), but for Jerusalem the old history ended there and then. Titus ordered to raze what was left of the town, except a few parts of the wall as a reminder. The city was now desolate, the walls in ruins. Of all of Herod's outstanding buildings, only part of the western retaining wall of the Temple Mount (now known as the 'wailing' or 'western' wall) and three towers near the present Jaffa Gate were left to show later generations how a proud and might city had been humbled by Rome. It was to take 60 years before the ruins were rebuilt as a town again. They re-named it Aelia Capitolana. Jerusalem's Jewish population was deported and replaced by soldiers of the Roman Tenth Legion (now the permanent garrison), their families, and some civilians, Hellenists from Syria and elsewhere. Vespasian, who had led the triumphant army, was appointed emperor. He and his son Titus marked their victory by minting a coin bearing the inscription "Judea is captured." Until then Jews throughout the world had sent donations to the Temple in Jerusalem. Now they were compelled to pay a special tax to support Roman temples. With the Jewish "gods" now safely deposited in Rome, the Romans assumed that the Jews were vanquished. But although the Jewish communities around Jerusalem quickly recovered (many bought back their lands from the Romans), tension between the Jews and their Hellenistic neighbors led to Jewish uprisings in Egypt and Cyprus in 115-117. The revolts were serious enough to compel Trajan to stop his Persian campaign and return to restore order. More revolts followed, the last one following Hadrian's outlawing of Judaism. This Bar Kochba revolt lasted three years, from 132 to 135, and was only crushed by the massing force of ten legions, a third of the Empire's army, at the cost of the lives of (according to Cassius Dio) 580,000 Jews. So many Jews were sold as slaves that the price of a slave was the same as the price of one day's supply of hay for a horse. 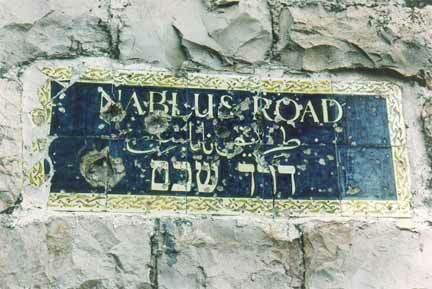 So many Jewish towns were destroyed that this revolt marked the end of the old Israel, and the start of the Diaspora. 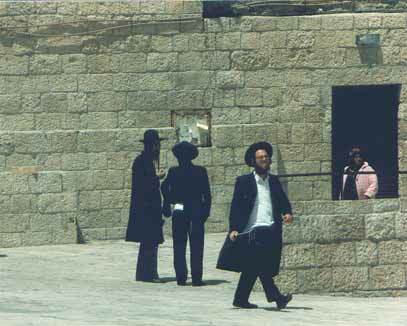 Jews were now forbidden to reside within a ten mile radius of Jerusalem. Construction of Aelia Capitolina resumed, the city being the only city in the Roman Empire created and settled by the army, in which the citizens were on active duty. Aelia Capitolina was built according to the classic Roman pattern, in the shape of a square. 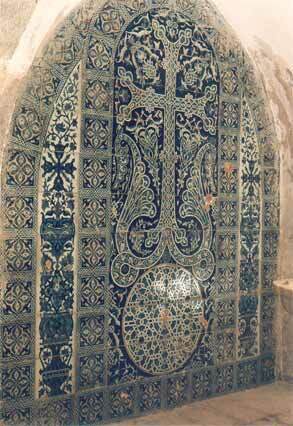 This Roman design is visible to this day in Jerusalem's Old City. 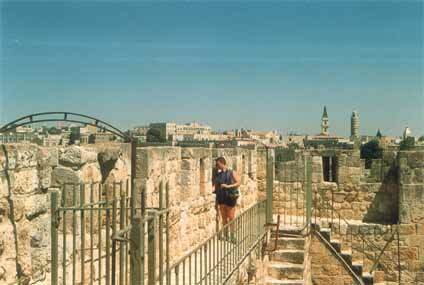 The city had four gates, one of each side of town (now called Damascus, Jaffa, Zion and Lions' Gates). 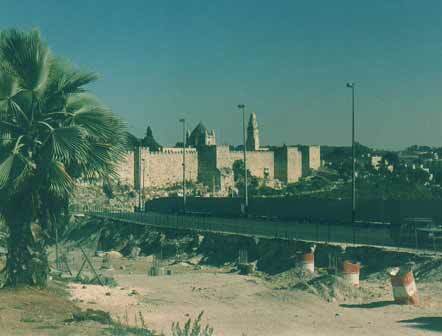 The main entrance was Damascus Gate, and a new road connected it to Caesarea. Damascus Gate was originally built as a triumphal arch. The Romans frequently adorned their cities with victory arches, which were sometimes located outside the city walls, to impress visitors with the architectural skill and power of Rome. 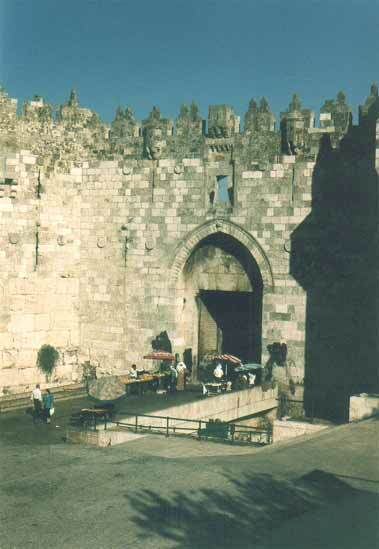 Part of the Roman gate can be seen today below the present Damascus Gate. Behind the gate was a pillar which was probably adorned with a bust of the emperor. Two main streets originating at Damascus Gate crossed the city. 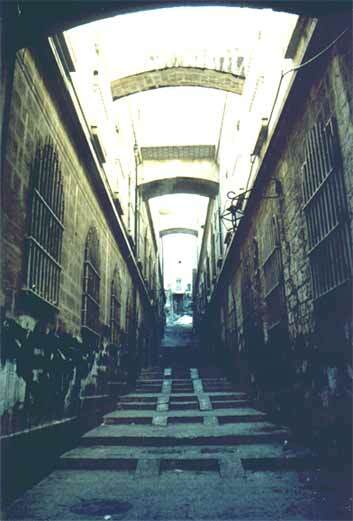 Part of one of these streets, the Cardo, is in the Old City's Jewish Quarter. Gradually, Aelia Capitulana/Jerusalem became a normal town again, albeit a Roman one. In 289, the Tenth Legion was transferred to Eilat after more than 200 years of service in Jerusalem, and Jewish pilgrimage to Jerusalem was resumed on a small scale. At the beginning of the fourth century the Roman Empire embraced Christianity, and Jerusalem became again important as a religious capital, with the family of Constantine starting a building program again - churches this time. It is also possible that the walls or Jerusalem were rebuilt at the end of the third century or later in the Byzantine period. 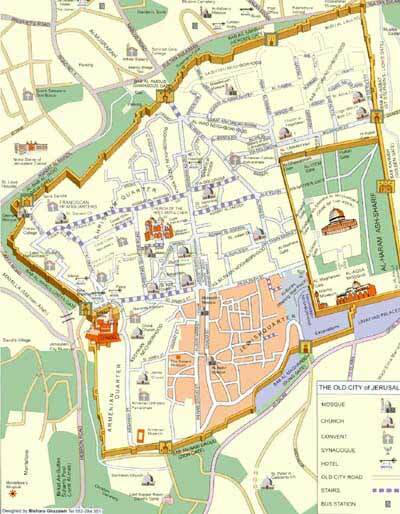 The present walls of the Old City were built by the Ottomans in the 16th century, but they basically follow the course of the Roman walls. Thanks to a lucky survival, we have a good idea of how Roman Jerusalem looked. A 6th c. church floor in Medeba, Jordan has a mosaic map of the land of Israel with numerous place names in Greek. 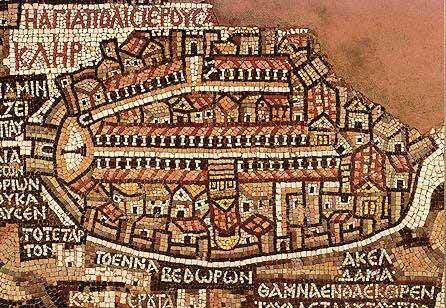 The center of this 'Medaba Map' is an open-faced depiction of Jerusalem with the city walls, gates, churches (with red roofs), and the Cardo. This main street of the city is depicted with two rows of colonnades running the length of the city from north to south. Index to Jerusalem from the Madaba Map. Although there are many Roman remains in Jerusalem (most of the quite hidden), I have looked for two of them especially: the Cardo and the Ecce Homo Arch. 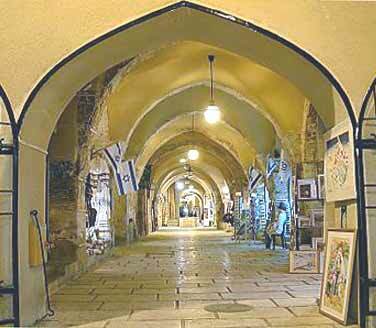 This great street that once ran across the middle of Jerusalem, today no longer exists but for a few remains. 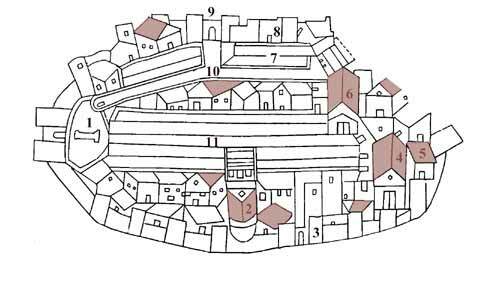 It is a remnant of Aelia Capitolina, the Roman city built over the ruins of Jerusalem, with a new grid system built on two broad thoroughfares intersecting at right angles. The east-west axis was the Decumanus. The north-south axis was the Cardo Maximus. 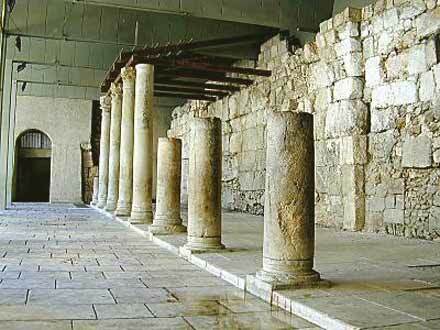 The word 'cardo' comes from the Greek word for 'heart; this was one of the central roads of the Old City. The Cardo was 22.5 m. wide, divided by two rows of 5-meter high stone columns (the Cardo is also known as the Street of the Pillars) into a broad street flanked on either side by 5-meter-wide covered passageways. A wooden beam construction supported the roofing, probably of ceramic tiles. Bordering the street on its eastern side was an arcade of large arches supported by piers built of ashlars. Shops lined the street along its southwestern part; more shops were located behind the arcade of arches. Originally the Cardo was about 22.5 metres wide but later Old City developers built a row of buildings down its middle making a narrow road on either side - Chabad Street and Hayehudim Street. The cardo - former main street. This this the reconstructed part in the open, now well below street level. The cardo - former main street. This this the reconstructed part showing the roof. The cardo - former main street. This is the part converted to a shopping mall. Large churches flanked the Cardo in several places.The southern part of the Cardo was only built during the reign of the emperor Justinian (527-565) as a continuation of the earlier, Roman, northern part, thus linking the two main churches of Byzantine Jerusalem the Holy Sepulcher and the Nea Church. In the twelfth century, the Crusaders built a covered bazaar over a section of the Cardo; from this section, the debris of centuries have been removed and modern stores offer their wares to shoppers. 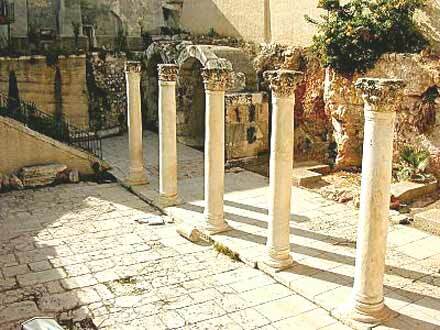 The Cardo in the Jewish Quarter was excavated for about 200 meters by Nahman Avigad's team in the 1970s. Today the Byzantine street is about 6 meters below the present street level, indicating the level of accumulation in the last 1400 years. A portion of the Cardo has been rebuilt as a modern shopping lane. Another section of the Cardo has been completely restored, together with roof, and another section has been restored in the form of a small shopping centre, interspersed with archaeological discoveries. 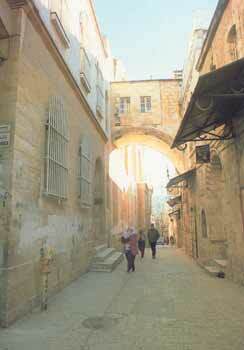 Another fascinating remainder of old Roman Jerusalem is the Ecce Homo arch. There were four Roman monumental victory arches in the city. 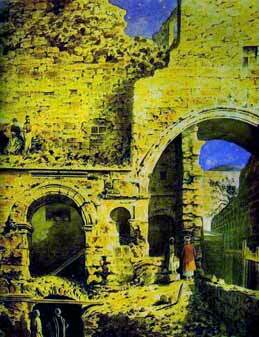 One was the Damascus gate, but the most famous is called Ecce Homo. Now hidden inside two buildings, this was once a free-standing triumphal arch of the kind we know from other places in the Roman Empire. Based on the style of the arch, which has three entrances, most archaeologists assume it was built during Hadrian's reign. However, many contend that the arch existed in the days of Jesus. Medieval Christian sources relate that Jesus was tried by the Romans nearby and claim that this is the spot where the Roman procurator Pilate presented Jesus to the people (John 19:5), thus explaining the name of the arch and the station ("behold the man"). This is how Ecce Homo arch may have looked - Constantine's arch in Rome. Already much ruined, but still in the open. Today the arch and the pavement (lithostratos) which has games from Roman times incised in the stones, are part of the Via Dolorosa (i.e., "Way of Sorrows") that marks the traditional route which Jesus walked on the way to Calvary. 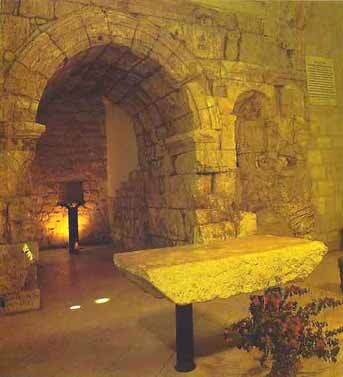 At one time the arch was believed to be the site where Pilate pronounced judgement on Jesus. 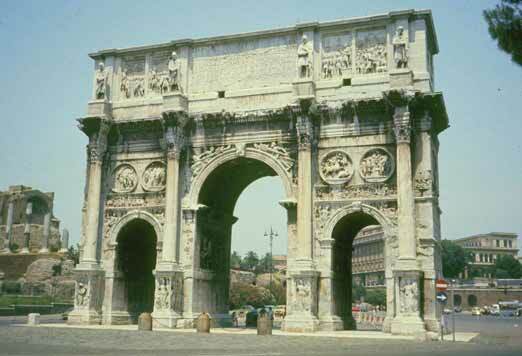 However, most archaeologists now believe the arch dates to the time of Hadrian, about a century after the crucifixion. The Via Doloroas itself is also evidently not the route which Jesus could have taken, because of the Roman destruction and rebuilding of Jerusalem after His death. The Ecce Homo arch is partly preserved inside the Ecce Homo-Basilica or the Notre Dame de Sion monastery. We arrived in Jerusalem under the threat of war between the Western powers and Iraq, and the possible resulting chemical attacks on israel. Most people were very worried, but without able to tell exactly why. Maybe I'm just being a fatalist. Notwithstanding the threathening war over Kuwait, the hotels and hostels of jerusalem were packed to capacity, and it took us some time to find a room at a Youth Hostel (and even there we would have to move should 'proper' guests arrive). Not cheap either. When we visited the Old Town it turned out the Arab quarters were on strike and most shops closed. On Friday were made the mistake of venturing into some alleyways in the Arab quarter, only to suddenly find ourselves the target of several 5-year olds who pellet us with stones.. We turned tail and flee! This happened a second time at Siloam, not very nice to find yourself unwanted.. But that's the Middle East for you. The walls of Jerusalem. No longer Roman, but very impressive nonetheless..
Betsy hiding from the sun. 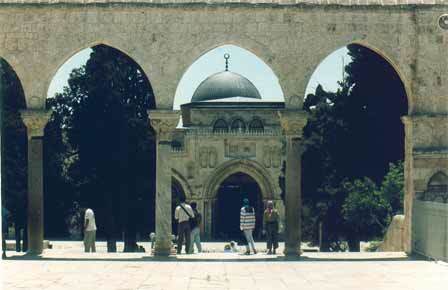 The Al Aqsa Mosque, showing distinct Romano-Byzantine influences! 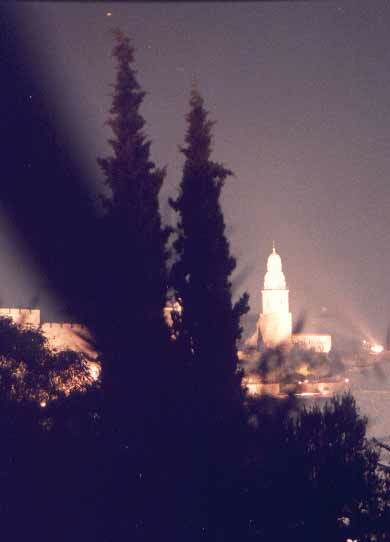 As a city outside from politics, Jeruslaem is a dream, with its millennia-old hitory and modern society. The Israel Museum I recommend to anyone, it is not a Museum that, as some might expect, displays history 'from the point of view of the scriptures'. I found the interpretations of the Israeli archaeologists quite open and unbiased. I visited twice, there was that much to see. 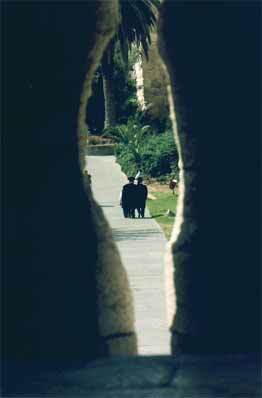 To my shame I must confess not going to yad vashem. I did not trust my emotions enough for that. I did visit the Shrine of the Scrolls, but I was not as impressed with that, some nationalist messages did enter into that display, unfortunately. For those reasons I did not visit the extremist otrthodox Mea She'Arim either, the 'crow's quarter. Bigots in my eyes, extremists even, who are subsidised by the Jewish State, but which they refuse to defend as soldiers. Their number is growing, squeezing out more liberal-thinking Jebusites from several streets. A shame. We received a far more enthusiastic response from the Armenians, who were delighted when we showed some knowledge of the Turkish massacre of the Armenians in the early years of the 20th century. One older gentleman even kissed me - to my horror! 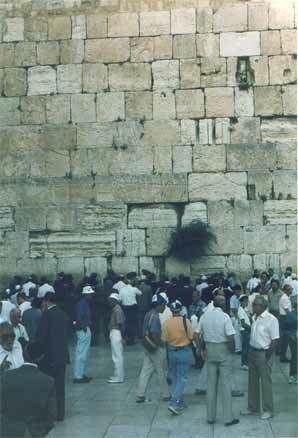 A visit to the Western Wall that same evening was more impressing. We missed the sounding of the horn and suddenly it was shabbat! My taking pictures (not allowed!) 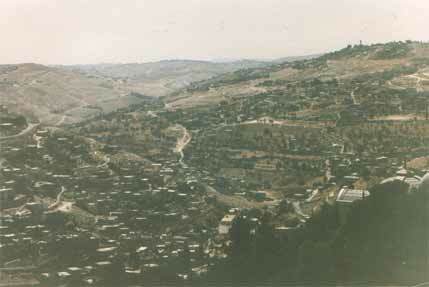 was clearly frowned upon from above, for the next morning I was robbed while changing money..
Contested land - looking across Palestinian and Jewish villages towards the hills of Judea. 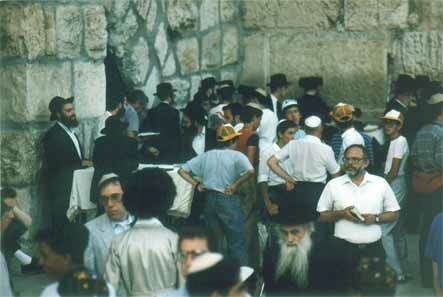 Prayers at the Western Wall after the start of the shabbat. 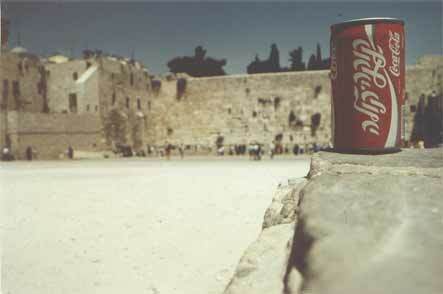 Archaeologically speaking, Jerusalem was very modern. Although a Roman 're-foundation' on a very old fundament, the later centuries clearly left their mark. 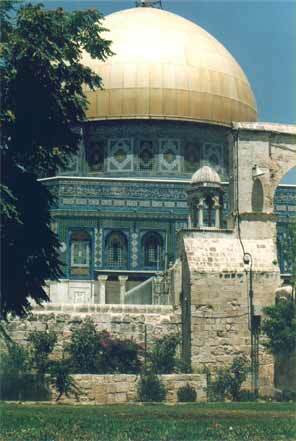 The Temple Mount was very beautiful and impressive but at the same time very Medieval and cleary shaped by centuries of Islamic government. A few pockets of Roman remains could still be found (I've described these above), but these have been built over by millennia of settlement. Unlike Rome, which shrinked on itself after the end of the Roman Empire, Jerusalem continued to flourish for a thousand years. Only when occupied by the Ottoman Turks the town dwindled to a provincial backwater. I found Jerusalem a bit of heaven and a bit of hell. It seems so much people feel to be close to God, but at the same time those people don't want the others to have that right. 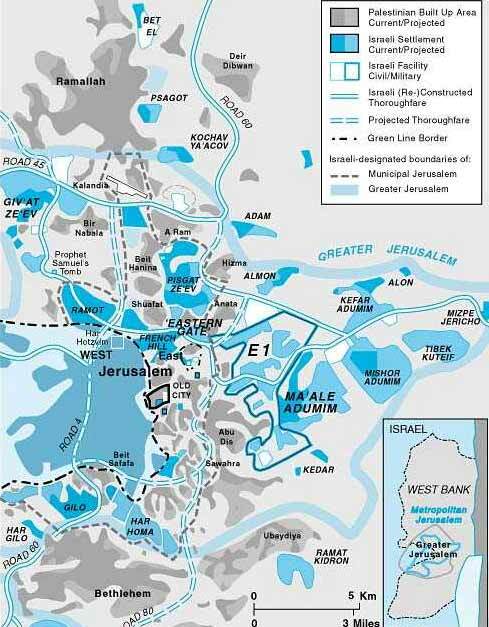 The latest abomination in the Palestinian-Israeli conflict (in which none of the parties seem to strive for either peace or even compromise) is the building of a big wall, which physically excluses some citizens of Jerusalem from their own city! 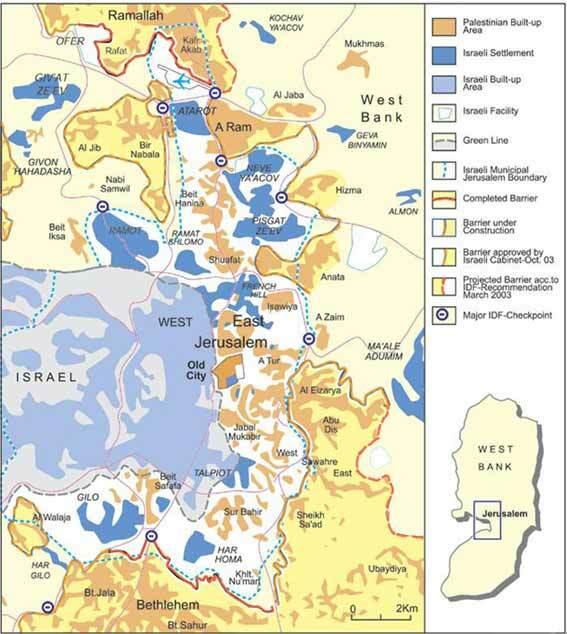 Have the Israelis not learnt from their own past, when Jordan excluded them? This has but little to do with protecting citizens, but all the more with creating borders and stealing land..
Connolly, Peter (1981): Greece and Rome at War, (repr. 1998, Greenhill, London). Flavius Josephus: De Bello Judaico (The Jewish War). Flavius Josephus: Antiquitates Judaicae (Antiquities of the Jews). Nicolle, David and Angus McBride (ill.) (1991): Rome's Enemies (5): The Desert Frontier, Osprey 243, (Osprey, London). Simkins, Michael, and James Field (ill.) (1988): Warriors of Rome, an illustrated military history of the Roman Legions, (Blandford, London). 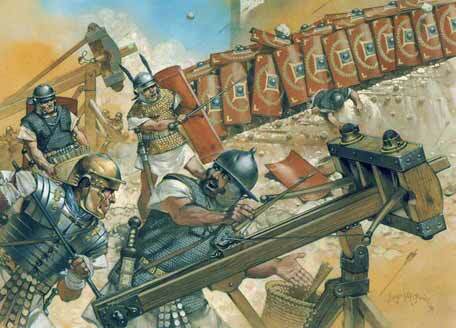 Windrow, Martin and Angus McBride (ill.) (1996): Imperial Rome at War, (Concord Publications).